American Girl Doll activities for more sophisticated girls! It’s time for summer! Girls, are you ready for some fun? 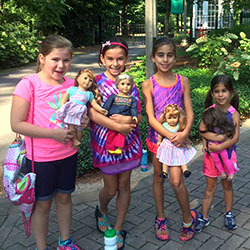 Bring your doll to camp at Aldridge Gardens. (May also include My Life or Our Generation Dolls.) You and your doll will explore the magic of the Gardens, you’ll make all kinds of accessories and crafts for you and your dolls, and even have a tea party! Join us as we make new friends and great memories!